Political parties have only recently become a subject of investigation in normative political theory. Parties have traditionally been studied by political scientists in their organizational features and in relation to the analysis of related topics such as party systems and electoral systems. Little attention, however, was paid until recently to the normative assumptions that underlie partisanship and party politics. Are parties desirable for democratic politics? How should liberal democracies deal with extremist and/or anti-democratic parties? Do religious parties undermine the secular distinction between religion and politics and is that bad for liberal democracies? These are only some of the many questions that political theorists had left unanswered for a long time. The chapters in this collection aim to provide a twofold contribution to the normative analysis of partisanship. On the one hand, they aim to offer a first much needed ‘state of the art’ of the existing research in this area. 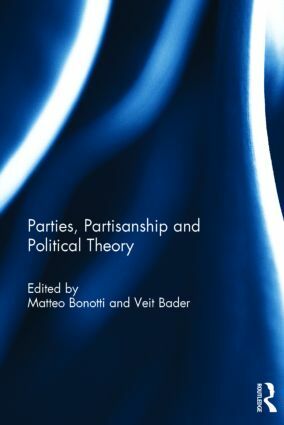 Many of the contributors have already done extensive research on partisanship and their chapters partly reflect their research expertise and individual approaches to this topic. On the other hand, all chapters move beyond the authors’ existing work and represent significant additions to the normative literature on partisanship, thus setting the standards for future research in this area. This book was published as a special issue of Critical Review of International Social and Political Philosophy. Matteo Bonotti is a Lecturer in Political Theory (fixed term) at Queen’s University Belfast, UK. His research interests lie in contemporary political theory, with a special focus on the normative dimensions of partisanship, John Rawls’s political liberalism, religion and political theory. He is also interested in the normative dimensions of food policy and language policy. His publications include articles in Res Publica, Ethical Perspectives and Politics. Veit Bader is Emeritus Professor of Sociology (Department of Political and Socio-cultural Sciences) and of Social and Political Philosophy (Department of Philosophy) at the University of Amsterdam, The Netherlands, and a member of IMES (Institute of Migration and Ethnic Studies). He has written on a wide range of issues in critical social theory; social inequalities and collective action; democracy and the rule of law (particularly in the EU); racism, ethnicity and citizenship; ethics of migration and incorporation of minorities; global justice; governance of religious diversity. His most recent book is: Secularism or Democracy? Associational Governance of Religious Diversity (2007).